You’ve heard me say it time and again, I love Indianapolis! I didn’t need a “best of” list to make me believe Indianapolis is a great place to live, but when the news prints something that speaks of the great benefits of living in Indianapolis, I’m right there, saying, YES! MSN, with the help of Sperlings Best Places, has just published it’s “Real Estate Best Bargain Markets”. Once the figures were compiled and the list created, Indianapolis ranks as the 6th best real estate bargain market. When it comes to Real Estate, Indianapolis is one of the most affordable cities in America. Again, it’s not all about price, though. It’s the bargain of living in an affordable city with access to a wide range of benefits and amenities Where else can you have access to a dynamic, renovated, revitalized downtown like Indianapolis? You want sports, we got it! Arts and entertainment, check! Museums and culture – done! 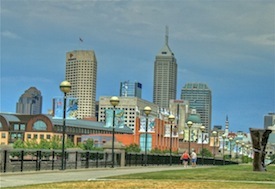 If you need more ideas about what to do in and around Indianapolis, search AroundIndy.com. You want to know more about real estate in Indianapolis and the suburbs around Indianapolis, you know who to contact. Vance - Thank You! I think you are my biggest fan :)Indianpolis is a wonderful city for both living, playing and raising a family. We love it here! Having visited Indianapolis a number of times, I know it's a great city. And to have been listed in the top 10 of best bargains is a great coup! This should be "shouted from the rooftops", as you've ably done here with this article. Nice post!